A hefty indictment has been leveled against modern worship services in the past years. 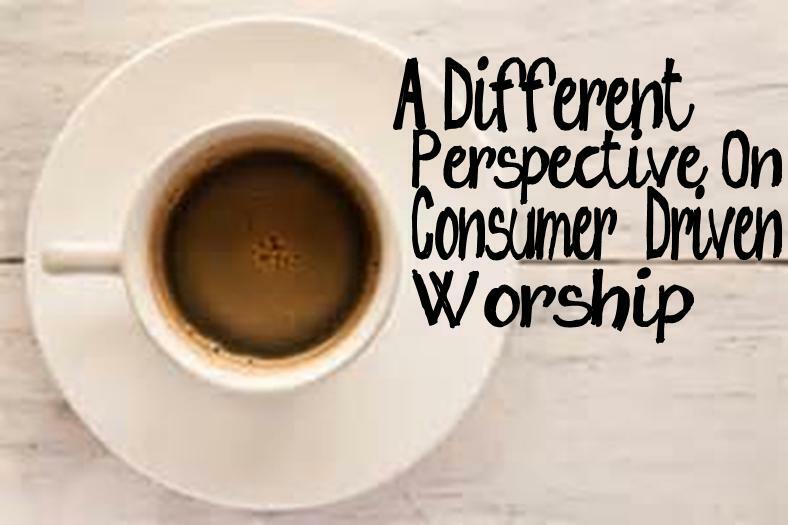 The term “consumer-driven” has emerged as the front-runner for describing what we as worshipers have created. In a well intentioned desire to be relevant, attractive, and welcoming, we have served up a worship service that is geared mostly toward the idea that worshipers are best viewed as customers coming to consume. I’ve even heard the term “customer service” come out of the mouths of church leaders when they’re talking about caring for people we’ve been entrusted by God with. And you know what? I get it. I understand why a local church should position itself as a place of refreshment, enjoyment, and acceptance. I get why we should seek to make people feel at home, feel welcome, and feel at ease. But at what expense? It seems far too often that its at the expense of forgetting an even bigger, far more important truth. I have no problem creating a “consumer-driven” worship experience as long as we agree that God is the consumer. God is the one to be focused on. God is the one to be adored. God is the one to be made welcome. Consumer-driven? Sure. As long as God is consuming us instead of us consuming our preferential entertainment and calling it worship. THAT’S the only kind of consumer-driven worship I can get behind. Sounds a lot like God is the purchaser here, doesn’t it? So how are Christians reckoning themselves as the center of attention? As the ones consuming? As the ones to be catered to? Do I think churches should do all they can to be engaging, to meet needs, to embrace anyone and everyone who comes to worship, to go all out in creating an atmosphere of love and acceptance? Absolutely. But in our quest to win the guest, we have lost our grip on Who is to be the ultimate object of our affection and attention. Bill Hybels has made Willow Creek famous for this. For all intents and purposes, the concept of “seeker friendly worship” was coined at Willow Creek. Its now commonly referred to as the “Willow Creek model” of ministry. Popular? Sure. Effective? It surely can be effective at certain things. But it can also be taken to the extent where we lose sight of the One we are worshiping in exchange for the comfort of those who come to worship. What do you think? Am I off? Where have you seen consumer-driven ministry? Can this approach be done “right”? ← Come & See, Go & Be. Our culture molds people to be consumers – it seeps into all of our minds. Mostly anyone coming into a worship service has this mentality unless there’s been an intentional surrender & commitment to overcome it. Start with that understanding of people, including ourselves. Our responsibility as leaders is to understand counter-transference – seeing where people are placing their dependence, meeting them there, & then giving opportunity to transfer it where it belongs, in this case, Jesus and His way. If everything in worship points to Jesus – no matter what methods used, people are taught He’s the One to depend on, & that intentionally causes a questioning of a consumeristic worldview. I think it is Biblical according to James 2 to be seeker friendly. I think the problem is that people who should be past the seeker phase, even people who have been Christians a LONG time, insist on staying stuck in the 1 Corinthians 3:1-3 spot… often even to the detriment of living out James 2 and reaching seekers. It really goes hand-in-hand with your previous post, too. We are most attractional when we are being missional. We can’t divorce those things. And we would be maybe more effective to use them in describing the individual lives of believers rather than a worship service since it’s really the believers who are the Church, yes? Absolutely! But we cannot be so inward focused that we lose our passion for the mission, nor can we be so outward focused that we lose sight of the God who has commissioned us. Thanks so much for sharing a great perspective! Thanks so much Mr. Faith! That’s a huge encouragement. Hope they’re helpful! I absolutely agree with your assessment of where so many have lost focus. I really believe we need to return to the “Simple Church” model. Worship is what it is as typified in scripture. It is about God. It is for His glory. The would-be worshiper has only worshiped when Spirit has touched spirit and transformation has taken place and God is glorified. Everything else is incidental to and supplemental to that. Great post!